Double-Decker bus used for the transport of visitors at the 2007 RIAT at RAF Fairford. 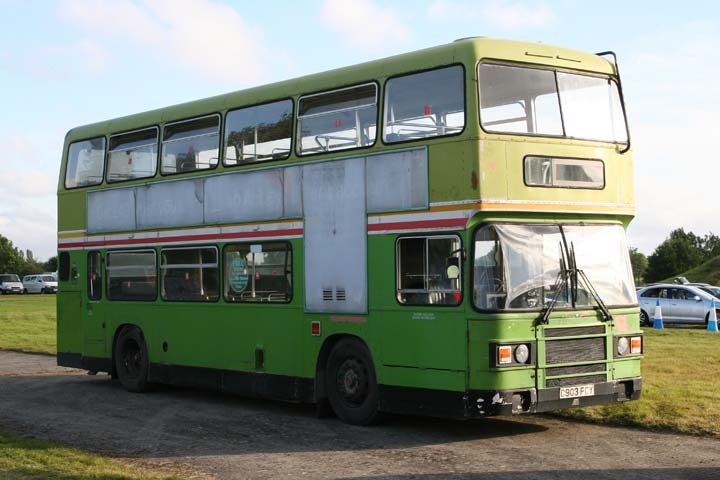 The Leyland Olympian was a double-decker bus built by British Leyland/Leyland Bus in the United Kingdom from 1980 to 1993. * Eastern Coach Works (ECW) - highly popular. * Alexander, with various R-type bodies; very popular with Irish and Scottish operators as well as the export market. The ECW body was built to two heights, low-bridge 13ft 8in or high-bridge 14ft 2in. The ECW, Roe, Leyland and Optare versions were outwardly very similar in design, thus identification can be difficult. ECW also manufactured a coach body on the longer chassis for long-distance use, which carried noticeably different styling. A dual-door variant of the Olympian was manufactured by ECW especially for London Transport, and this became known as the L-class, since this was the letter used by LT to denote the class of vehicle. It was not as popular as the purpose-built Titan, so only 350 entered service under LT. A small number remain in service in London, with the L-class and other Olympians proving popular with small operators across the United Kingdom.